I have heard this quote shortened to, be the change you want to see in the world. Either way, it is an important spiritual truth. And one area that it applies to is transparency with all things. Jesus teaches us that it is loving to be open and truthful about all aspects of our lives, even if it means we might offend someone, make people angry, embarrass ourselves, or expose areas that we prefer to keep private, like personal finances. Most of us would like our governments and businesses to be honest and open about how they spend their money. We would like to know where the money flows because it tells us a lot about how organizations are run. But how can we expect those organizations to be transparent if we ourselves are not? That would be hypocritical. So many of us are now choosing to be the example for change. The finance topic is a challenging one for me because in my family, there was much secrecy around money. I never knew how much money we had, and any financial challenges we ever had were never discussed. As a typical sensitive child, I could feel that my parents didn’t want it discussed, and I was well trained not to upset them, so I didn’t ask or talk about it. I felt like we were probably middle class. We had a four bedroom house with about two acres, and although it was not fancy, it was in a pretty well to do neighborhood. And eventually, I got to have horses! But neither my mom or dad were spenders. They were quite frugal, but I didn’t know if it was out of necessity, injury or preference. I thus learned to adopt a private attitude around money as well. When I feel about the reasons around that, I come up with fear. I am afraid people will feel jealous (which does happen), or want to take advantage of me (which has also happened), or want to take advantage of my family in some way, or judge me because I only had a short time in my life (about 8 years) when I needed to work full-time like most people do their whole lives. During those years I managed commercial landscapes (1 year); did administrative work for the California Department of Education (4 years); owned and operated (with two other folks) a health-food store (4 years), in Etna, California, until it burnt down in 1998; worked at a local Feed and Garden Supply store (2 years), and did part-time massage therapy (4 years). About a year after the health-food store fire, my income started to be modestly supplemented through a family trust funded by real estate that my family owned. It was only $800-1000 per month, but soon after receiving it, I arranged my life so I could live entirely on that small income and not have to work except for some part-time massage therapy. I always valued my own time, and was quite happy living a simple life doing what I preferred to do, like gardening, permaculture, spiritual pursuits, rebuilding my house with my husband, and later, music. I am so grateful for this gift, because it allowed me to have quite a lot of freedom in my life. I also got in the habit of having time to pursue things that are important to me, and now that I am attempting to learn God’s Way, that habit is proving very useful. So as part of this journey towards Love–the way God sees Love–I need to confront this fear of exposure and start to share about my financial situation. So here goes. Here are some links to the last several years of my 1040 Tax forms, as they are an accurate summary of my finances. In 2012, I also sold my little house in Etna, California for $104,000 (a loss), but that allowed me to travel to Australia and live frugally without working for several years. At the present time (August, 2016), some interesting things are happening financially. I understand there is a connection between finances and certain emotions. I have always had big issues with self-worth and feeling totally unsupported emotionally due to repeated judgement, ridicule, blame, and control, among other things in my family life, as well as poor choices I have made. My father used to regularly point out that I should have been a doctor and stop wasting my life. But instead I pursued things neither of my parents could relate to, especially Divine Truth, about which they became quite abusive in attempting to stop me from pursuing what I believe in. Anyway, I have always believed that I didn’t have much money because I didn’t conform to the system, and regularly living below the ‘poverty’ line was part of that choice. But in recent months, since following my dream and moving to Arizona (see My Dream) I started feeling many different childhood emotions, including emotions of not feeling emotionally supported, and lack of self-love. And a big shift has happened for me financially. Could this really be related? I don’t yet trust my interpretations of the Law of Attraction, so I am not sure of what is happening, but its wonderful. Most of this money I will spend on materials and labor to create my home. I want to install water systems like gutters, tanks, swales and small ponds to collect and hold water on the property. I want to install a solar system for power. I want to rebuild a dilapidated shop on the property so I can have not only a shop, but also a weaving studio for my art. I want to have a vegetable garden. I want to bring in lots of wood chips to improve the soil. I want to plant hardy trees and shrubs that will bring nutrient and vegetation to the land and its inhabitants. I want to propagate those hardy, nutrient fixing plants and trees until I have plenty to share with others. And if there is any money left over, I may even invest * in a solar-oven company that I have been following for years, pining over their awesome cookers. This company, called Solar Chef was created by Sam Erwin around 50 years ago. I had one of his early ovens but needed to sell it when I left the USA for Australia in 2011. 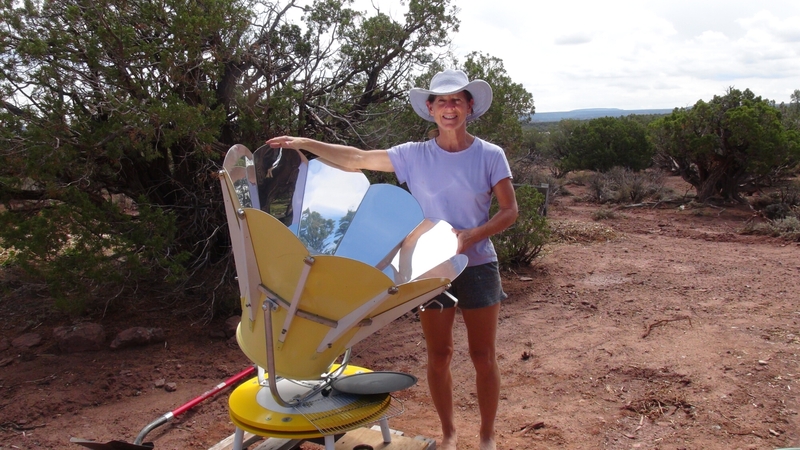 Me at my new home with an updated model of the Solar Chef that Sam gifted me (August, 2016). Solar Chef ovens are the most amazing ovens. And so many people can benefit by them coming back into production. They had been on hold because Sam is in his 90’s, and is no longer building them for sale and doesn’t have the money to put them into production. He and I have been in communication since this last winter, and he is really excited about the idea of me investing in his dream and getting his even more upgraded creations out to the world. And I am hoping we can arrange something so I can receive a modest but regular income as the company grows, which I know it will. And as long as I can afford to, I will keep donating to my favorite good cause, Divine Truth. Note: The ongoing financial reports will eventually be incorporated into an About Me page when I get that page put together, so it an be found more easily.